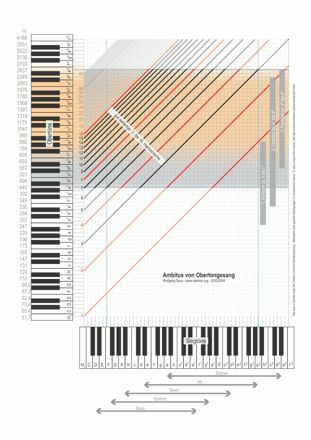 Composers will find here information about the “instrument” overtone singing and templates that simplify composing. If questions remain unanswered, I will be happy to support. I am delighted with every commitment to this new instrument. Feel free to contact me. For western overtone singing there are two fundamentally different compositional approaches: Melody overtones or timbre overtones. Melodies are sung with overtone singing technique. They sound like a spherical mixture of glass harp and flute. The sound material is the natural harmonic series. Natural melodies have a calming and meditative effect. Melody overtones are to be considered as a second instrument in composition. Both overtone and fundamental melodies simultaneously enable real polyphony – a singer can sing in a canon with himself. Flowing transitions into vowel overtones and normal singing are possible. Timbres are sung with vowel harmonics. It is little known that timbre can be composed down to the last detail. Vowel harmonics are the link between speech and overtone singing (see choral phonetics). Synchronous timbre shifts are a new stylistic element for choral music. Interesting sound scape effects result when a choir sings several overtone melodies in a jumble. The effect is often perceived as a lively synthesizer sound (cf. Glenn Keiles’ film music to “The Life of Buddha”, or Bernat Vivancos’ “Obriu-me els llavis, Senyor”). Smooth transitions from speech to overtone singing are also possible. The range of overtone singing varies according to the singing technique. The NG technique is suitable for lower overtones, the L, R and J whistling techniques are suitable for higher overtones. There are two limits for overtone singing: The absolute limit of possible frequencies, and the relative limit of the position in the harmonic series. Frequency limits: For physiological reasons, harmonics can only be sung from about A4 to D7 (approx. 440 to 2500 Hz). NG technique: approx. A4 to B5. L/R/J technique: approx. E5 to D7. The limits are set by the resonance frequencies, i.e. by the shape limitations of the vocal tract. Limits of the harmonic series: At the same time only the harmonics 3 to 16 can be used for melodies. For most singers, clear overtone melodies are only possible up to the 12th harmonic, a few sing up to the 16th. In Tuwa and Mongolia, singers do not sing beyond the 13th harmonic. Depending on the desired timbre, partials up to 20 can also be sung, which then have a strong fundamental in the sound. The upward limitation is due to the narrow spacing of harmonics from 12 upwards. The 2nd and 1st harmonics are not heard as separate overtones. The combination of both results in a specific overtone ambitus for each fundamental. I use G2 as the lower limit for the fundamental voice. It is possible to sing clearly isolated overtones on G2. The upper limit is C5, on which a soprano can still sing the harmonics 3, 4 and 5. With G5 the tone is reached on which only the 3rd harmonic (D7) would be singable. In theory, 7 overtones could be sung on C2, provided that the singer still applies enough pressure to his vocal cords in this low register to produce loud overtones. C2 is an extreme position that does not occur in any composition I know of. The comfort zone, which many western overtone singers find pleasant to sing, is marked green. This range is suitable, for example, for choir compositions that can easily be performed by experienced amateur choirs. Professional singers can occasionally sing beyond the specified range. Since there are only a few professional overtone singers, more complex solo works are more likely to be adapted individually. The ambitus of the overtones is almost the same for all registers. Women’s voices have a slightly shorter vocal tract and are about 2 to 3 semitones higher than men. 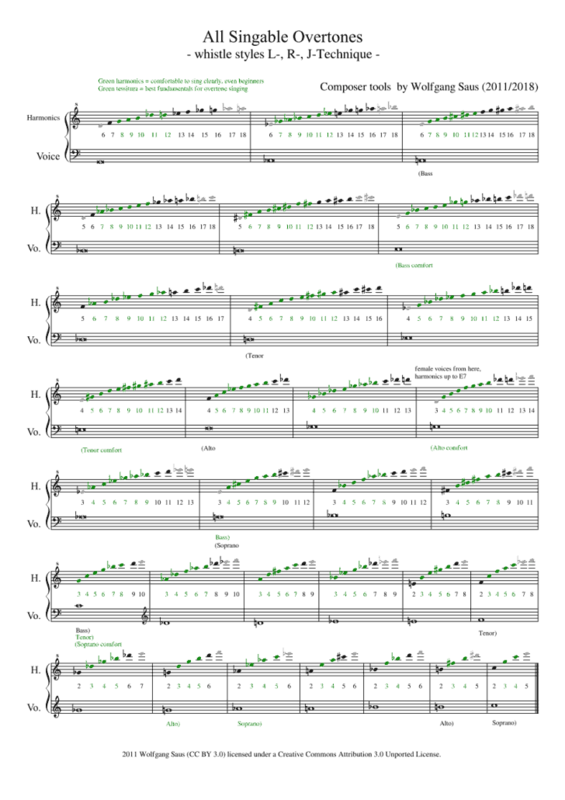 However, the fundamental ranges usable for female overtone singing are much smaller than the normal singing range. The lowest singable overtone is either E5 or the 3rd harmonic, whichever is higher. The highest singable overtone is either D7 or the 16th harmonic, whichever is lower. 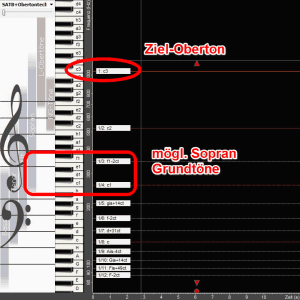 An overview of all singable overtones in notes. From G2 in bass to C5 in soprano all overtones in L-, R-, and J-technique are notated, which are suitable for melody formation. The comfort range is green again. This scheme summarizes all essential information about the relationship between singing pitch and overtone singing. For the singing notes (lower keyboard) from B1 to the F6, the overtone series can be read vertically upwards. The pitches that can be achieved with overtone singing are highlighted as grey (NG technique) or orange zones (L, R, J technique). Those overtones that lie in an overtone zone and simultaneously between the 3rd and 16th harmonic are well singable. 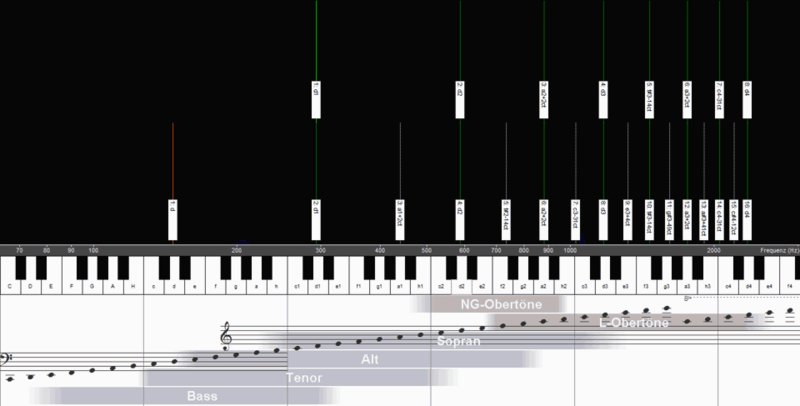 The overtone slider is the predecessor of the “Overtone Analyzer/VoceVista Video” software. It consists of the piano scheme plus the harmonic slider. It contains all essential information about the range of overtone singing. 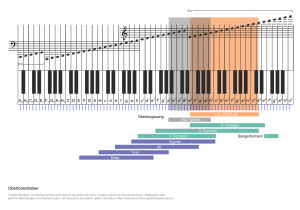 The piano scheme shows the pitch ranges of the different voice sections, the range of the formants (resonance frequencies of the vocal tract) and the range of the singable overtones (the range of the double resonances in the overtone technique). If you place the harmonic slider onto the piano scheme, you can immediately read off the singable overtones. The harmonic slider represents the sound produced by the larynx, the chord of harmonics that make up the voice. This partial chord interacts with the resonances represented in the piano scheme. You place the fundamental note of the harmonic slider on the singing pitch and you can then read off the singable overtones. Overtone Analyzer software allows you to easily find all the fundamental tones for any overtone: The undertone series of an overtone consists of all the fundamental tones that can be used to create that overtone. All undertones within the range of the desired pitch can be used as the fundamental for the target overtone. Example 1: Assuming that in a composition C6 should be sung as an overtone by a bass singer. Each undertone of C6 can be used as a fundamental if it is in the vocal range of the singer. The range of a bass is approximately between E2 and E4. There are the 4th to 13th subharmonics of the target overtone C6 within this range. This means that e3 can be sung as overtone by a bass from the fundamental notes E2, F2, F2#, G2#, A2#, C3, D3, F3, G3# or C4. Example 2: Let us assume that in a composition C6 should be sung as overtone by a soprano. Each subharmonic of C6 can be used as a fundamental if it is within the singer’s range, the soprano having a range of about A3 to E6. There are the 2nd to 4th subharmonics of C6 within this range. The 2nd subharmonic is omitted as a possible fundamental because C6 as the 2nd partial would not be perceived (see section “Tonumfang” above). So only the fundamental notes C4 and F4 are available to the soprano for C6 as an overtone. G#7 is the highest overtone I have heard. It was produced by the throat singing masters Hosoo and Steve Sklar. Throat singing sounds louder, higher and more compressed than western overtone singing. The upper limit of the 2nd formant is D7. Since the whistle overtones are produced by the double resonance of the 2nd and 3rd formant, a different technique is probably used by throat singers in the highest register. I suspect that a double resonance of the 3rd and 4th formants is produced. 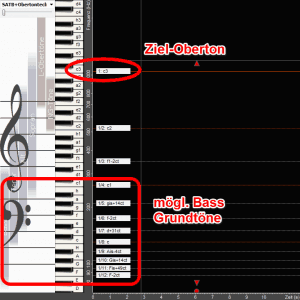 Few experts reach the 24th harmonic. The interval to the 23rd is very narrow and is only about 2/3 of a semitone. If the 24th harmonics is to be sung and D7 is not to be exceeded, G2 (98 Hz) or lower must be selected as the fundamental. The harmonics 5 to 24 are then available (the 4th harmonic then is G4 which is below the lower overtone limit A4). Men and women have almost the same overtone range, because the vocal tract is much less different than the singing range. The voices are an octave apart on average. With high voices, the overtones are less dense, so there are fewer overtones available for overtone singing. Men and women both have a range of overtones from A4 to D7, but there are different numbers of overtones in this interval. While a soprano ( top ) can sing the overtones of the 2nd to 4th octave on D4, i.e. the harmonics 3 to 8, a bass/tenor ( bottom ) can sing the harmonics 3 to 16 on D3. In both cases the frequency range of the overtones is the same, i.e. approx. A4 to D7. But the tenor can sing twice as many overtones as the soprano, so he has a greater choice of steps. For melodies with narrow intervals sopranos have to change the fundamental more often. C2 as the fundamental: From C2, many overtones would be available, but from the 16th harmonic onwards the intervals become so narrow that they can hardly be separated. Since E5 is the lowest singable overtone (L-technique), it is only possible to sing upwards from the 10th harmonic of C2. But C2 is usually too low for normal singers to get enough sound pressure in the overtones. A2 as the fundamental: On A you can already sing up to 11 partials. C3 as the fundamental: On the middle position C3 of the tenor there are 12 possible notes. C4 as the fundamental: The soprano on C4 can still sing 7 harmonics, but these are in the range of the larger intervals. The smallest singable interval in the harmonic series of C4 is the Pythagorean full tone between C7 and D7. 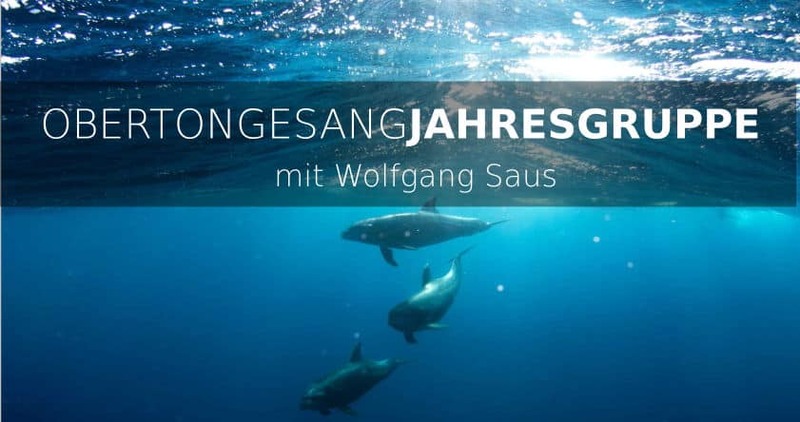 Singbare Obertöne auf verschiedenen Grundtönen.